TORONTO (Reuters) - Canada's health regulator on Monday set out thresholds for a new class of cannabis cultivation and processing licenses, and outlined strict requirements for the packaging and labeling of recreational marijuana ahead of its legalization this year. The proposals were published in a document released by Health Canada, taking into account feedback from a public comment period on new cannabis regulations. The final regulations will be published after the cannabis act is passed. 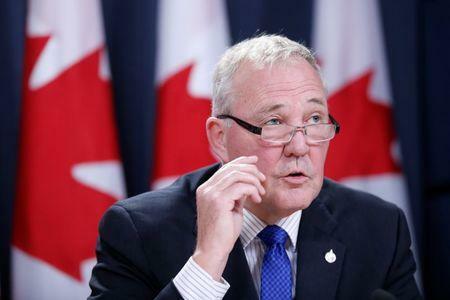 Canada, the first major industrialized country to legalize recreational pot nationally, wants to ensure that the industry is tightly regulated and the product remains out of the hands of people under 18, Bill Blair, parliamentary secretary to the Ministers of Justice and Health, said in a statement. The proposal includes the introduction of new micro-cultivation and micro-processing licenses to enable small-scale producers to participate in the legal industry, according to the paper. A micro-cultivation license would authorize the growing of a plant canopy area less than 200 square meters (2,153 square feet), and a micro-processing license would allow the processing of less than 600 kilograms (1,323 lb) of dried cannabis, or its equivalent, each year. The regulator also said it will require that all cannabis products be packaged in a tamper-evident, child-resistant opaque or translucent container and include a health warning on a bright yellow background, a standardized cannabis symbol and the tetrahydrocannabinol/cannabidiol content. The product's label and package should be in a single, uniform color excluding any fluorescent or metallic colors, according to the report. Only one brand element, such as a logo, would be allowed in addition to the brand name.